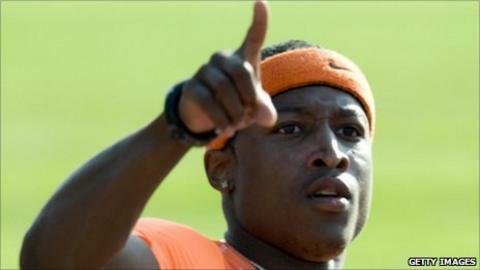 Former United States 100m champion Mike Rodgers has tested positive for a banned stimulant, his agent said. Rodgers, the fourth fastest man in the world this year, is now a doubt for the World Championships in South Korea. His agent Tony Campbell said the 26-year-old had mistakenly drunk an energy drink which contained the stimulant. "I don't want anyone to think Mike is a druggie. It was a stimulant. It was not steroids or anything of that nature," he said. "He went to a club with some friends in Italy and he thought he was drinking a Red Bull but he got one of those energy drinks that had a stimulant in it." The World Championships take place in Daegu from 27 August to 4 September. Campbell said the positive test happened last month at a meeting in Lignano, Italy, where the US team had a relay training camp. He said 2009 American champion Rodgers had passed all previous tests, including a blood test several days ago, but has yet to have his second B test sample tested. Campbell said he expected him to remain in the team until the final result was known. Rodgers ran a personal best of 9.85 seconds in June and was later third in the US trials for the World Championships. In 2008, Rodgers said ahead of the World Indoor Championships that beating British sprinter Dwain Chambers - who had returned from a two-year drugs ban - would give him a lot of satisfaction. "If I beat him it will be a more powerful thing for me because I would have beaten a dirty athlete," he said. But Chambers won a silver medal as Rodgers finished fourth in the 60m.